If you’ve received the delivery message, but can’t find your package, try these steps. If you think the item might be lost in the mail, see Item lost in the mail. Sometimes a delivery person will put a package by a different door than you usually use, like a garage door or side door. Other locations to check are at the base of a letter box, or on top of a block of mailboxes. When the delivery person doesn’t think the package will be safe, they can leave a notice that they weren’t able to deliver it. The notice will usually say the day they’ll try again, and/or where and when you can pick it up. Ask around: Do you have a neighbor, building supervisor, roommate, or relative who might have picked up the package and put it somewhere? Most packages that can’t be found by a door are put somewhere safe by someone you know. 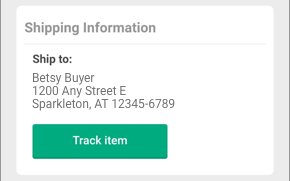 Your shipping address is listed on your receipt, which you get to through your messages about this item. Find the message titled Offer accepted! and tap View receipt. 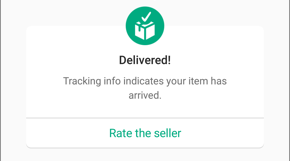 Find the Shipping Information section. If your address isn’t correct, please use the Contact Us button at the end of this help topic. Please select I have questions about shipping on OfferUp in the form so we can direct your question appropriately. If you still can’t find the package, try the US Postal Service Missing Mail & Lost Packages page.